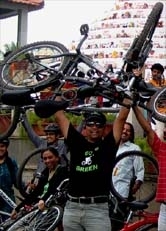 Go Green Independence Day-Ride - GGI-Group size: 4000+ Professionals, Increasing on day to day basis, Come & join us 2 serve Mother Nature. We started our independence day ride from our usual place Reliance- I Store at around 7:45am. Totally we were 25 of them and we distributed small Independence Day badges to everyone in the team and we wore it on our Tees. We covered much greater distance today than our usual campaign rides. 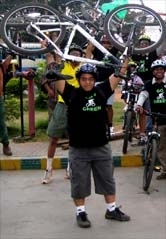 Our Major Srinivas was carrying our National flag and leading the team. Hope we could reach out to a lot more people. Jaynagar 4th Block - Jayanagar 3rd block - Devi Showroom (Mahadevan park circle)- Ashok Pillar-Siddhiaya Road - Lalbgh rear gate - Lalbagh front Gate - Double road - Right under flyover - Lavelle Road - Jewels De Paragon - Cubbon park - Vidhan Soubha - GPO - Paradeground Road - Brigade Road - Residence Road - Double-Road - Lalbagh Sidhiya road gate -. 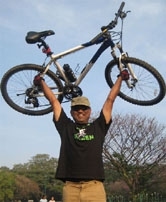 We could enter Lalbagh @ 9:30am with our cycles for the first time ever. Special Thanks to Hunnan Burhan of HSBC for getting us special permission from Lalbagh authorities. We used the opportunity to campaign to the huge crowd inside lalbagh. We did several rides inside the park before we stopped at a point to pay respect to our country and the national flag by singing the National Anthem. Before leaving form Lalbagh Hunnan Burhan introduced his team members who were part of "SAAHAS" and were in Lalbagh for "Don't Litter Bangalore" campaign. Prabhakar Rao , Vishal, Thimmanna Bhat, Manoj, Rajaram,Tejus, Vishwanath, Sumit, Major Srinivas, Mohan, Srini, Sai Ram, Sudhindra, Sunil Kumar, Anup, Shantanu, George, Lavanya, Kiran. 3 more new people joined us in this ride.